New York stands tall in Call of Cthulhu canon. Not only are numerous scenarios set there, such as “Dead Man Stomp” from the Call of Cthulhu rulebook, but the city forms the backdrop for the opening sequences of three classic campaigns – Day of the Beast, Masks of Nyarlathotep, and Beyond the Mountains of Madness and for the whole of the modern campaign, Unseen Masters. Of course it has its sourcebook in the form of Secrets of New York, but even the invariably Pelgrane Press’ anglophile Trail of Cthulhu has its own anthology of New York set scenarios in the form of Arkham Detective Tales Extended Edition. The city has of course been visited in Lovecraft’s fiction, most notably in his “The Horror at Red Hook,” a short story that has itself been revisited three times by Lovecraftian investigative horror roleplaying. The city, coming into its ascendancy in the 1920s, stands equally tall in our collective imagination with its melange of cultures old and new, its drive to conquer the financial world as well as the sky itself with its monumental skyscrapers, and its vibrancy. It is this rich and heady, not so say hedonistic mix that has presented fertile ground for Lovecraftian investigative horror roleplaying in the past and does so again with the fifth release from Miskatonic River Press, Tales of the Sleepless City. 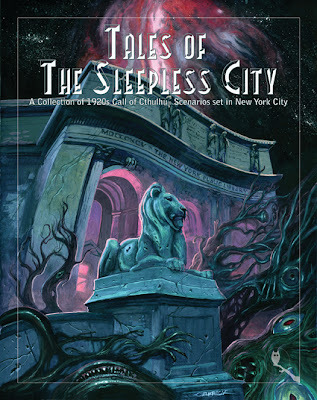 The release of Tales of the Sleepless City gets 2013 off to a great start in terms of printed titles for Call of Cthulhu and not just because it was actually released in the same week as Atomic Age Cthulhu from Chaosium,Inc. (A review of that will follow soon). Rather it gets 2013 off to a great start both because it is simply a good book and because it comes as a more than welcome relief – not to say a curative tonic – after the low plumbed with the release of Chaosium, Inc.’s Terror from the Skies late last year. Marking Miskatonic River Press’ third anthology, Tales of the Sleepless City brings together six scenarios that explore life as it is lived in the city of New York in the Roaring Twenties. Behind Paul Carrick’s dream-like cover, what strikes you first about Tales of the Sleepless City is how good the book looks. It is neat and tidy with various elements – side bars and hand outs, artwork and maps – judiciously placed to break up the text. In particular, the choice of typefaces perfectly evokes the period in which the contents of the book are set, while the use of the single interior artist further gives the book a cohesive feel, with many of the illustrations capturing some singularly nasty moments in the scenarios. Similarly, the use of the same map of New York again and again, each annotated with the different locations for each scenario also adds to book’s singular look. It is interesting to note that the map for each scenario includes its subtitle on the map. Lastly, each of the anthology’s hand outs, courtesy of the H. P. Lovecraft Historical Society, is a beautiful piece of work that should help immerse the players further into of each the anthology’s scenarios. The collection opens with Dan Harms’ “To Awaken What Never Sleeps”, which literally brings New York alive. It does call for the use of experienced investigators who have some knowledge of the Cthulhu Mythos, though this is as much for effect as it is for the actual knowledge. Steeped in the recent history of the city, it draws upon the works of both Fritz Leiber and H.P. Lovecraft to present antagonists who are literally opposed to its thrusting modernity. Beginning on a very specific date in 1928, it starts with a bang and goes on to infuse the very fabric of the metropolis with an unnerving sense of unease. Initially this is a difficult scenario to get into and the scenario also seems to take on elements of the Dreamlands before coming back to reality. Nevertheless, there are some nice set pieces that move it along and get the investigation moving along into a bruising finale. The second scenario is both a much more traditional and a more familiar affair. Inspired by the craze for all things Ancient Egyptian that followed the 1922 opening of Tutankhamen’s tomb – and also by certain urban legends – “The Terror from the Museum” by Brian Sammons is another tale of “revenge from beyond the grave.” This mania is brought to New York in decidedly grisly fashion as the consequences of a recent visit to Egypt comes back to bite a number of academics. It feeds into a heady, movie-like mix that combines xenophobia, a particularly pulp villain, and a certain Mythos artefact that makes its second appearance here. At its worst, this scenario could be a morass of clichés, but fortunately, the author lifts “The Terror from the Museum” above the clichés and leaves the Keeper with an interesting paradox as to the nature and status of the aforementioned artefact. If “To Awaken What Never Sleeps” literally brings New York alive, then C. Michael Hurst’s “The Fishers of Men” brings it to life by taking player and Keeper alike into the vibrant hotbed that is Harlem. The death of Doctor Harold Bejoujou, a local religious leader and noted manufacturer of the tonic ‘Dr. Harry’s Enlightenment’, brings the investigators to his funeral and an interview with his wife who believes that he did not commit suicide as the police believe. Getting the investigators involved in this scenario will not be easy, both because of the subject of race and the somewhat closed nature of the scenario. A mixed race group of investigators would go some way to alleviate this problem. Once involved though, they find themselves mixed up in community politics and strange magic. Its climax feels absurdly theatrical, but overall, this feels like a well-judged treatment of Harlem. “The Tenement” by Oscar Rios takes the investigators to the heart of a very New York problem – the slum tenements and slum landlords of Hell’s Kitchen. The investigators are hired by a well-meaning lawyer to prove a case against a slum landlord, Mister Edmund Grey. This involves their having to living in one of his buildings, the Buckley Arms, and persuading the much put upon tenants to give statements as to their ill treatment and the conditions in the building. This involves lots of dog work upon the part of the investigators as try and persuade their new, and often, recalcitrant neighbours. These NPCs are lightly drawn, but are no less interesting, so the Keeper should have roleplaying each and every one of them. As they gather evidence, Mister Grey becomes aware of the investigators’ efforts, the conditions in the tenement seem to worsen even as he sends in his muscle to coerce them. The climax to this well-written affair is shockingly deadly, so the investigators will need to follow up every lead if they are to be forewarned and thus have any chance of survival. Mikael Hedberg’s “A Night at the Opera” is a grand treatment of a subject familiar to Call of Cthulhu, the performance of Massa di Requiem per Shuggay, and indeed, it is a grandiose affair. The investigators receive tickets for the inaugural performance of a new opera at the Metropolitan Opera House, a performance that will also be attended by the rich and famous, such as Zelda Fitzgerald and John D. Rockefeller, JR. As the evening progresses – the events of the scenario literally playing out over the course of just a few hours – the observant investigators will begin to notice strange events occurring, and as the ones to have seen them, it is up to them to prevent the full ramifications of the opera being performed coming to fruition. Although it could be said that the scenario is too linear, there is much for the investigators to do within the confines of the Metropolitan Opera House and it is only a short scenario anyway. Indeed, this is a race to save not just everyone at the performance, but also the whole of New York all played out in one single evening, one single session. Rounding out Tales of the Sleepless City is the oddly titled “Értóng hé Kūqì de Mǔqīn” or “The Child and the Weeping Mother”, co-authored by Tom Lynch and Scott David Aniolowski. Like the earlier “The Fishers of Men”, this scenario takes place in one of New York’s communities, but Chinatown rather than Harlem. The investigators are asked by a local family to find its missing daughter. Yet both father and mother have something to hide and the investigators’ progress will be hampered by the intransigence of the tiny community and the criminal politics, if they tread carefully, both allies and informants can be found. As with the earlier “The Terror from the Museum”, this is a pulpy treatment of the exotic, though one with a nod towards the Wuxia genre rather than the horror movies from Universal Pictures. Coming to the end of Tales of the Sleepless City, it is far from easy to find fault with its contents. Such faults as there are can only be described as minor. It could be argued that the layout is too busy in places, but to be fair, everything about the layout evokes the Jazz Age in which its six scenarios are set. In places the tone of scenarios feels uneven – more so with “The Terror from the Museum” and “The Fishers of Men”, but these are minor marks against what is otherwise a solid selection of scenarios. With Tales of the Sleepless City, Miskatonic River Press continues its sure-footed treatment of the Mythos in Call of Cthulhu – five books on and the publisher has yet to put foot wrong in its support for the game. There is not a poor scenario amongst the six in this anthology, such that it would seem unreasonable to highlight any one of them over another, but it would not be unreasonable to say that the second three scenarios are more interesting than the first three. 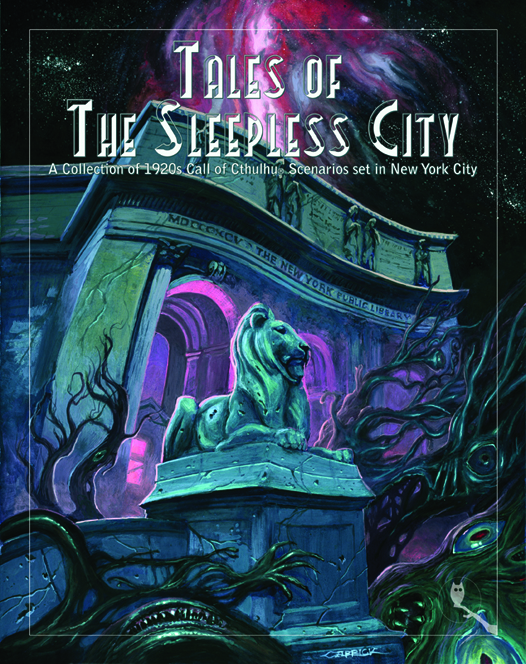 At its worst, Tales of the Sleepless City provides a solid set of playable scenarios that present some fine shocks and scares; at its best, Tales of the Sleepless City does not tell what New York was like in the Roaring Twenties for Call of Cthulhu, but actually shows you what it was like. Good review - I was very impressed with my copy. Thanks for this, Pookie. And your kind words about my maps, subtitles and map page trade-dress.